In Windows Server 2012 Microsoft introduced the new iSCSI Target which is now build in to Windows Server 2012 which allows you to connect to storage presented by your Windows Server. There are a lot of new way how you can present storage to your servers especially for Hyper-V. With Windows Server 2012 Hyper-V you can use block storage like iSCSI or Fiber channel or the new introduced SMB 3.0 file storage as your shared storage for your Hyper-V Clusters. 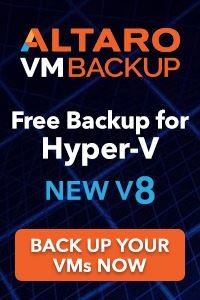 Now I am a huge fan of the new SMB 3.0 solutions which allows you to place Hyper-V virtual machines on a SMB file share, but there maybe other applications and scenarios where you need to present storage via iSCSI. However if you need to run the iSCSI Target in a production environment you will have a single point of failure and in this case you should cluster your iSCSI Target. To build a iSCSI Target Cluster is pretty simple, first install all the roles on both cluster nodes. 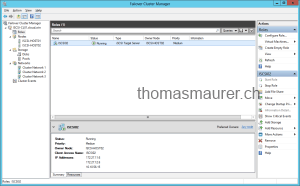 After this create a new Failover Cluster as you would with Hyper-V or other applications. If your cluster is up and running you can now add the iSCSI Target Server role. Setup the iSCSI Target with a IP address and a name. Choose the Cluster Storage which should be used for your iSCSI Target. Later you will setup VHDs on this shared Cluster Disk. 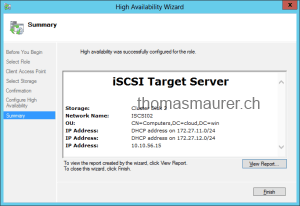 After you have checked the summary the iSCSI Target Server role will be created. The iSCSI Target Server role has been created the storage you have added to the iSCSI Target will be assigned to it. The ISCSI Target Server resource will be online. It’s also highly recommended that you use multiple NICs for you hosts and also use MPIO on the machines which will connect to your iSCSI Target. 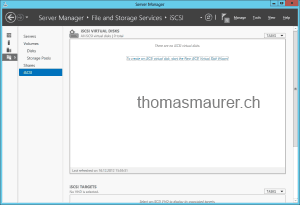 The iSCSI Targets have to be created back in Server Manager. Connect to the cluster node where the iSCSI Target Server is running on. After this is done you have to enter the name of the this and if you don’t have one already you have to create a iSCSI Target. You can connect multiple disks to a iSCSI Target and you can create multiple iSCSI Targets on your iSCSI Target Server, and maybe you will create even multiple iSCSI Target Server on your cluster so you can create a “static” load balancing where the Target Server 1 is running on the first host and the Target Server 2 on the second host. You mentioned “Choose the Cluster Storage which should be used for your iSCSI Target” in this blog. However, what’s this storage here? Is it a local disk on the computer? If this is true, how about the single point failure of local disk? IF it’s a LUN from SAN, why not use the LUN directly? How does iSCSI Target Cluster work? Does it replicate data on all nodes? So you create a cluster of iSCSI target. 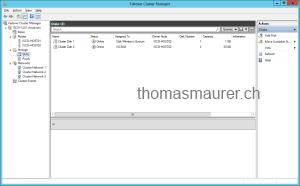 When you create a new target you use the shared disk (https://www.thomasmaurer.ch/wp-content/uploads/2012/12/iscsi-Target-Cluster-03-300×206.png). If this shared disk falls, then the iSCSI target become unreachable. The Shared Disk don’t have to be single point of Failure, because this could be a LUN from a Fiber Storage or SAS Storage or if they are just attached by JBOD over SAS they could be “Clustered” with a Windows Server 2012 Storage Pool. The reason why you may want to create such a iSCSI Cluster is the fact that there are maybe other Solutions which can not make use of SMB 3.0 and are not connected to a Fiber SAN so you may want to offer them connectivity via iSCSI. I don’t understand the point of the posting. In your scenario the HA (high availibilty) is decreased because the use of additional unnecessary iSCSi cluster. In a SAN or a iSCSI target is normally MPIO and HA (redundand CPU, HBAs, ..) implemented and you can connect your cluster nodes dircetly via SAN or iSCSI and MPIO. For better HA the single cluster nodes are separated in different rooms. So you can’t use DAS storage. For a realy HA you need a mirrored SAN or you can implement DRBD if there is no budget. Thanks Thomas for the answer. In fact I want to provide a iSCSI target. But i don’t want to have a single point of failure. Basicaly I create a iSCSI target with WS2012. But if this server falls then my storage is unavailable. So I would like to have 2 WS2012 with a single iSCSI target, one virtual disk stored on each server (duplicated). There are a lot of reasons you can implement that. Not anyone can spend a lot of cash for Storage Replication features and stuff like that. And with a single host as a iSCSI Target you have this host as single point of failure. If one server is down then iSCSI is still avaiable storage. I basically have a similar question as Jason. I have two WS2012, each with directly attached storage. Can I mirror that storage, to create a redundancy? Meaning that if one Server fails, the data is replicated and will still be available on the second server? No, you cannot mirror or replicate the storage, you need shared storage attached by SAS, iSCSI, Fiber. Hi, I am still confused after reading the article. Is it possible to have 2 Windows servers (in a Cluster) each with a freenas san attach via ISCSI connectors. Can I cluster or mirror the freenas san’s in case one san fails that the second san take over automatically? I have three IBM servers with local LSI ServeRaid controllers. The three servers are in a Failover cluster with file server, ISCSI Target Server, Target storage provider & dedupe roles. am i missing something or is there a limitation of some sort? You will need a storage replication software to mirror the local storage, like Starwind or Steeleye. 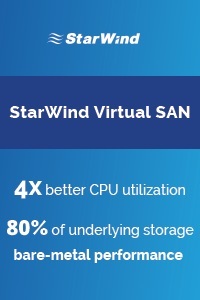 I am trying to run my lab using the Starwind software. They came with a free version that limits the size of the disk you can create. Its pretty good for testing out in a lab environment. @WILL…actually, you can create a iSCSI target cluster without shared storage. However, you will need a 3rd party replication solution like SIOS DataKeeper Cluster Edition to take the place of the shared disk. Could I configure on failover cluster, storage pool, then volumes on csv and then clustering iscsi target service to release the LUN? It’s dangerous put them on CSV? 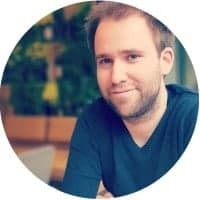 I don’t think ‘cos will not write the nodes of cluster on CSV but the initiators right? This ‘cos I’m implementing a new storage to manage the entire infrastructure and if there are many volume I wouldn’t manage many drive letters or neither manage mount point. I dont really see the point of this either.. Surely if you have a SAN at your disposal you would directly attach this to the WSFC?? The main reason why I am looking at this is that my solution is on cloud servers that I cannot attach a physical SAN to. The only solution I have found for a resilient file share is to have DRBD configured with 2 iSCSI targets. You then configure 2 further Initiator nodes, which, you then go on to install your WSFC. 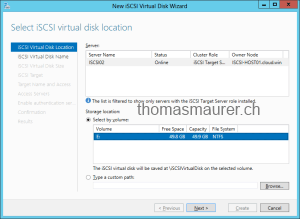 The Windows cluster then picks up your iSCSI targets as clustered disks…. 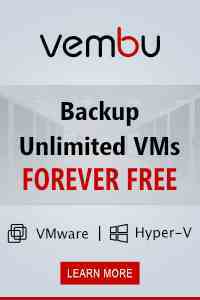 …However this requires 4 virtual machines which is heavy on compute hours. Unless there is some other way of configuring this? Great Post! – I have a old Dell EQ and used this guide to help get things going to provide support for Data Dedupe. iSCSI in from the Dell EQ as Shared LUN, then data dedupe back out to VMWare. I am setting up MSSQL 2012 DB cluster across two datacenters which have different networks. I have installed iSCSI target software on Windows 2012 machine at DC1 & created the Virtual drives. If DC1 goes down , this Windows server at DC1 will also goes down. So, I need virtual drives to be mirrored at DC2 as well. 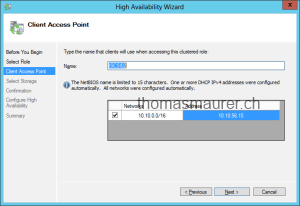 Can I install iSCSI software on Windows 2012 machine at DC2? Is there any document, to configure this? I need to avoid single point of failure.